'...I mean, 50 of your English squids for a ticket to the annual Frieze and Frieze Masters art fair, and what's the image from this event I'll take away with me? Okay, I know, you have no idea. Let me tell you. 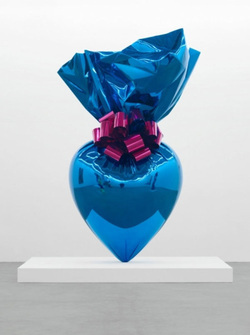 On Gagosians stand Jeff Koons is showing larger than life, day-glow sculptures. Which are everything one expects, bright, happy, funny and touchable. Touchable? Hell No! Fearing that someone may finger the art, the Gallery have employed two grey suited, rent-a-cop security guards to stop this from happening. Witness, if you will, Friday morning...Father and three year old son staring at the Tweety Pie tyre sculpture. The kid is fascinated, not having seen Tweety this big, and walks towards it arms outstretched. Suddenly, and with alacrity, security guard #1 throws himself in front of the sculpture and takes the groping intended for Tweety. Meanwhile security guard #2, who is now twitching and talking into his sleeve, reaches into his, two sizes too small jacket, and approaches the father. The kid grabs his dad's hand as the guards start to monster them. ...as the father and son, non-plussed, stroll off to the next stand. I'm thinking maybe next year they'll come tooled up for the Frieze experience . Oh! And incidentally as I was leaving Dinos Chapman was entering. 'Hi' I said. 'GrrrrrGrowl!' He replied, pawing the ground. Written Through the Eyes of Dave, a London Boulevardier. Dave chronicles his exploits as he tries to avoid the call of his studio and the haranguing of his dealer to complete a series of paintings for his forthcoming exhibition. Aided by a cast of street artists, sculptors, BDS&M actors, and willing artists models, Dave's adventures are a satire on contemporary metropolitan life. Charlton's book, Confessions of a London Boulevardier, featuring characters mentioned above can be found online at Amazon.co.uk. Click here to find it!